Re: Monthly reports for the Northern California 2014-15 rainy season. Just read in the paper that the governor of California is mandating water restrictions! Report said it is the driest it has been out there in 65 years. Dear Michael and WeatherCat disappointed observers of our political system. I don't know if your paper mentioned the theatrics that Jerry Brown went to in making the announcement. The press conference was held on a field of dead grass where normally there would be several feet of snow accumulated at this time of year. So our "dear" governor went to a lot of trouble to make his announcement as dramatic and compelling as possible. I wouldn't be surprised if Brown's staff have been planning this announcement for months. The trouble with all this is of course all that planning could have been instead focused on actually doing something that would help the situation. Brown has now dished out the pain and done absolutely nothing to provide any relief either in the short term or the long term. Certainly at this point, building more desalination plants would seem to be highly-desirable and these can be built quite quickly. If the governor had jumped on this back in January, there is a chance some plants would be online before the end of the summer. However, . . . . . all we've got is an actor and thanks to that everyone in California will suffer more than necessary. Edouard and sunny clime enthusiasts in the former colonies. I dinna think that realistically that any Governor anywhere would be able to push the construction and commissioning of a desalination plant in the timescale that you mention, let alone the number and size of plants that you would need to give the volume of fresh water that is required. Who is going to build them, private companies or the state ? Where is the funding coming from ? What about the environmentalists ? After all somebody may wish to build a plant on the only spot where the Lesser Known Uncommon Spotted Californian SandFly breeds, thus wiping out an entire species of irritating blood-sucking Dipteran. Oh, as an aside, over here we end up with water restrictions after about 4 -6 weeks of below average rainfall, this in a country where it seems to rain almost every day ! This plants actually can be built in a hurry. It has been done for communities around San Diego during earlier droughts. let alone the number and size of plants that you would need to give the volume of fresh water that is required. Of course not, but any supplement sources of water means that rationing doesn't have to be as harsh. Well, during World War II the United States accomplished some amazing things. What it takes is 1.) a recognition of a crisis and 2.) leadership. Item #1 is taken care of, Item #2 is most definitely lacking . . . .
That extra rain meant that to date, Orinda has received 70% of a normal rainfall. Given how gloomy things are, it is worth asking the question what would happen if no rains fall in May or June. 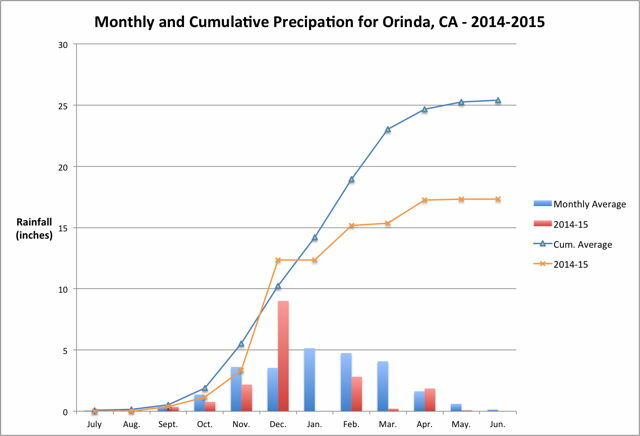 That would leave Orinda with 67% of normal rainfall for the 2014-15 rainy season. Unfortunately, that isn't were most of our water comes from and the snow-pack is essentially nonexistent. Reservoirs were already depleted from the 2013-14 season, so clearly California is in a mighty deep hole. May brought a return to well below normal precipitation. While the month has been unusually cool and cloudy, only 0.08" of rain fell which is only 13% of the normal rainfall for the month. It was so little that the graph basically shows no change. With that weak performance, Orinda has received 68% of a normal rainfall to the end of May. So little rain falls in June that if no more rain falls, the overall results for the 2014-2015 wet season would remain at 68% of normal. I have upgraded to drip irrigation were practical, so our water use is greatly reduced. However, even such technology has its vulnerabilities. This morning, one of our drip circuits had a fountain instead of the normal drip action. When I checked, an animal(s) had chewed on at least 5 emitters damaging them so either they could drip or failed all together. Barring a miracle, we won't get any significant rain until late October or later. It is going to be one L O N G dry-spell . . .
By June standards, it was a above normal month for rainfall. The 0.25" of rain received on June 10th was almost double the normal of 0.15". Alas, in the overall year, it was nothing more than a drop in the bucket and hardly met the water needs for the month. For comparison, the Penman–Monteith estimate of grass evapotranspiration for the month of June is over 4.6 inches already and the day isn't over. Still the additional rainfall created one modest correction to the 2014-25 statistics. It was sufficient to raise the percentage of normal rainfall at Canebas weather station from 68% to 69%. So far there hasn't been any additional rainfall from the monsoons. Rain is falling in southern California and monsoonal moisture is reaching northern California, but in insufficient quantities to bring any rainfall. The missing ingredient appears to be hurricane activity in the eastern Pacific. After 3 hurricanes in short order, none have been formed since. So dry northern California continues to hope for rain . . . .
Oh well, . . . Edouard . .